Stokke Flexi Bath is a foldable baby bath suitable from birth to four years. The space saving design makes it easy to store and convenient to use at home or when traveling. encouraging more shared bath time moments. The optional Stokke Flexi Bath Newborn Support provides additional comfort for newborn babies. Uniquely foldable for easy transportation and space saving storage. The design-awarded Stokke Flexi Bath Newborn Support ensures an optimal ergonomic position and use from birth. Stokke Flexi Bath™ Newborn Support is not included. 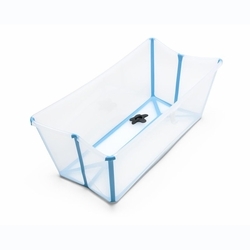 Product dimensions (length x height x width): 26"x9.4"x15.4"
Folded product dimensions (length x height x width): 24.8"x9.4"x3.9"
Polypropylene (PP) and Thermoplastic Elastomeric (TPE). PP is the hard material that makes up the sides and bottom of the baby bath providing stability. TPE is the soft and flexible material used on the corners and bottom to enable folding of the bathtub.